Third in the Once Upon a Christmas series. Here Santa prepare for his Christmas Eve journey as music plays and lights move to the beat. Santa stands in front of a cheval mirror, at Santa's feet is a miniaturized version of the 2009 Mischievous Kittens, a kitten playing with a reindeer slipper. The slipper's mate is behind the cheval mirror. 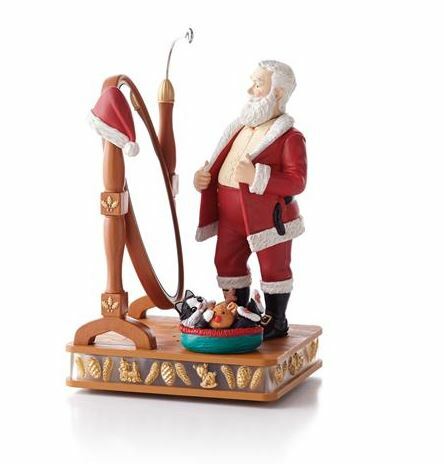 This Hallmark Christmas ornament originally offered as a Hallmark Gold Crown Exclusive. I love this set enough that when I found this one not working this year, I went ahead and ordered a new one. I don't know why the first one quit working, I pack them up carefully each year and all the older ones are still fine. The grandkids love to push the button and hear the song; and the lights just make the set look so merry. However, if others quit working I don't know that I want to replace them at the high costs. Is there a way to repair them. The local store was not helpful.